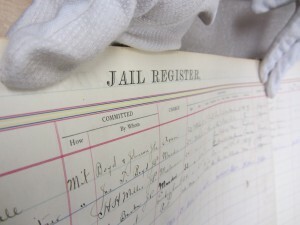 Our Jefferson County jail register, covering the period 1878 to 1929, is being sent to the conservator today for much-needed restoration. 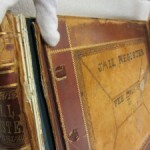 It was used at the courthouse formerly located at 15th and Washington in Golden, and is now part of the City of Golden collection. 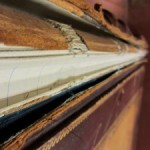 The pages will be carefully cleaned of mildew, and the spine re-sewn and re-glued. We expect to have it back later this year. Here is a coincidence, I saw an old gun holster at a gun show, maybe 1880 or so. Written on the back in much more recent magic marker was John Nicholls and under that Sheriff. It was a double loop Mexican rig. There is probably a lot of Sheriffs named Nichols, but you never know? Do you have any photos of your ancestor with a holstered gun? Wow, unfortunately I don’t but I will ask my family. Did you manage to get a photo? I did, my personal email is bberryama@gmail.com. Sorry to take so long getting back to this site, I thought it was closed. Was your ancestor’s rig ever in a display somewhere?